Much of the public commentary on Jeff and MacKenzie Bezos’ divorce has revolved around how much money each person will be entitled to while divorcing in a community property state and in the absence of a prenuptial agreement. Some worry about what the divorce may mean for Amazon, the company Jeff Bezos founded, and lament Jeff’s potential loss of power at the company. Others counter that he could never have built such a substantial fortune without MacKenzie subordinating her own career. Even commentators who advocate for MacKenzie’s right to 50% of the Bezos’ assets still label the assets accumulated as “his wealth,” something she would be taking from him rather than shared assets to be divided evenly. The amount of money involved in this divorce is mind boggling. But Americans are divided over such questions even when smaller amounts of money are involved. And expectations of sharing money throughout a marriage are also changing. In my forthcoming article in the Journal of Marriage and Family, I report on an original 2016 survey of nearly 4,000 adults who are demographically representative of the U.S. population. I asked survey respondents to select a money organizing approach for a fictional couple. Participants were randomly assigned a summary of an identical couple except for four characteristics: each partner’s monthly earnings, the couple’s marital and parental status, and the length of their relationship. Respondents were asked if the couple should: (a) Have a shared account in which they both deposit all their earned income; (b) Keep all their earned income in separate, individual accounts; or (c) Have both a shared account and separate, individual accounts. About half of U.S. adults believe that married couples should share all earned income, no matter who contributed the bulk of it. But the other half believe that married couples should withhold some or all of their earnings from a shared account. Overall, about 40% prefer a partial-pooling option, with the married couple sharing some money and keeping the rest in separate accounts. Ten percent take an entirely individualistic approach, believing married couples should forgo pooling finances, with each person keeping all their own earnings in separate bank accounts. When respondents were told the couple was living together but not married, about 50% of respondents chose a partial-pooling approach for the couple and the rest were closely divided on whether cohabitors should integrate everything or keep all income in separate accounts. Among people who believe married couples should take a partial-pooling approach, most think that the higher-earning partner is entitled to a greater share of the total household income, reflecting his or her earnings advantage in the labor market and greater contribution to the couple's standard of living. A similar pattern was found among respondents who were told the couple was living together but not married. Interestingly, when asked to get specific about how much more of the household assets should go to the higher-earning partner, people allocated a slightly larger share to the higher-earning woman than to the higher-earning man. ​We know that in most couples, men still tend to be the higher earner. Women, more than men, tend to forgo earnings for the sake of the family. In the Bezos’ example, MacKenzie gave up a job at a hedge fund in New York to move to Washington state for his career. One reason couples tend to prioritize men’s careers over women’s careers is because of the persistent gender pay gap. Women are often disadvantaged when it comes to making choices about staying in the labor market too, as couples talk about paying for childcare out of the mother’s earnings rather than as a household expense. Although people believe that it is fair for higher-earning partners to keep a greater share of the total assets within marriages, and likely when they end, the path to unequal outcomes for men and women has already transpired. Part of the show’s charm is the way it illustrates how gender inequality at work is wrapped up in gender inequality at home. To take a real world example, explaining her success, U.S. Supreme Court Justice Ruth Bader Ginsburg once said, "I had a life partner who thought my work was as important as his." Research backs her up. Wives who opt out of the labor force often have husbands who earn enough so they can “choose” to quit their jobs, rather than husbands who actively support their careers. Gender dynamics in families may hinder women’s progress at work in overt ways too. It’s unlikely that men who demean women at work act as equal partners in their personal relationships. For instance, television personality Bill O’Reilly was fired for sexual harassment at work and was previously accused of domestic violence at home. About half of domestic violence victims are harassed by their abuser at work. The year following an assault by their partner, 50% of victims leave their jobs. That’s one reason domestic violence costs the economy $5.8 billion each year. The spillover between home and work also affects single women, who may avoid actions that benefit their careers if they perceive those choices will undermine their prospects for marriage. #MeToo has prompted justified outrage about the loss of women’s talent in the workplace. At the same time, everyday inequality in families holds women back. But can we legislate equality in families, the way antidiscrimination law targets inequality at work? Righteous anger against overt discrimination is easier to rally around than changing nebulous gender norms in private contexts. One possible pathway is leveraging the momentum of #MeToo, such as by requiring employers to offer workers paid sick and safe leave so women don’t have to choose between their safety and a paycheck. Research also shows that fathers’ parental leave is related to more equitable divisions of household labor, women’s employment is critical to their ability to leave bad relationships, and equal pay may translate into more equal division of labor in families. Employer policies can alter power imbalances in the home and at work. 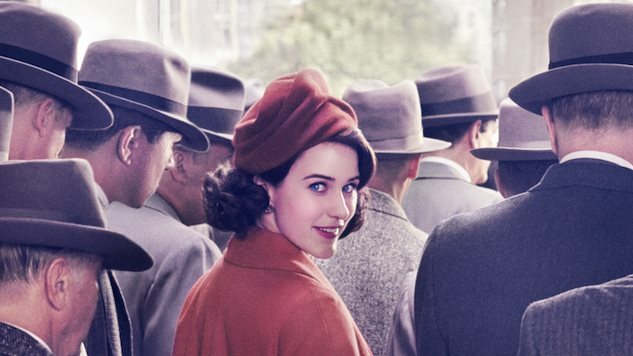 As exemplified by the actions of Mrs. Maisel’s husband, intractable gender inequality must be challenged in workplaces and in the home. Yesterday, the New York Times published an op-ed piece by Stephanie Coontz titled “Do Millennial Men Want Stay-at-Home Wives?” In it, Coontz highlights research I co-authored with David Cotter which is featured in a set of reports by the Council on Contemporary Families (CCF). Based on nationally representative survey data of high school seniors (Monitoring the Future), we show that youths’ attitudes about gender in families became more progressive from the mid-1970s until the mid-1990s, after which the trend reversed course. The take-away from our research of high school seniors’ attitudes is that millennial men and women are mostly in agreement about gender dynamics in families, and they are less progressive than we thought – and less progressive than they were two decades ago. 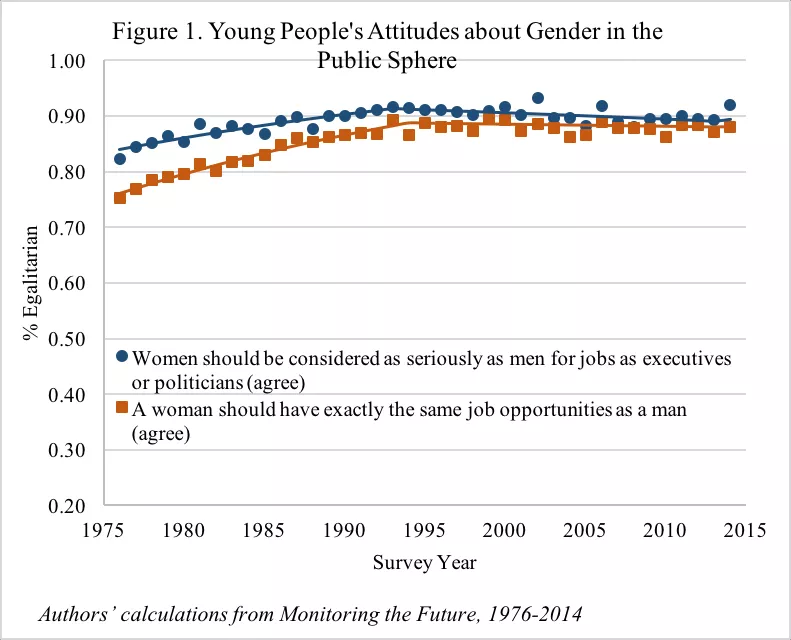 The surprising trend in youths’ attitudes about gender in families is not that young men hold more conventional beliefs than young women, but that both men and women are espousing less egalitarian beliefs than before. Cotter and I describe the trend, presented below, in our response paper in the CCF symposium. ​The second misinterpretation from our findings is that youth do not support women’s and mothers’ employment. The comment section of the New York Times article shows people rehashing the “mommy wars” debate – do people prefer a stay-at-home mother arrangement or a dual-earner partnership. This is understandable given the New York Times headline and our emphasis on the increasing agreement that the male breadwinner/female homemaker model is best for everyone. However, Monitoring the Future data show a much more complicated story. 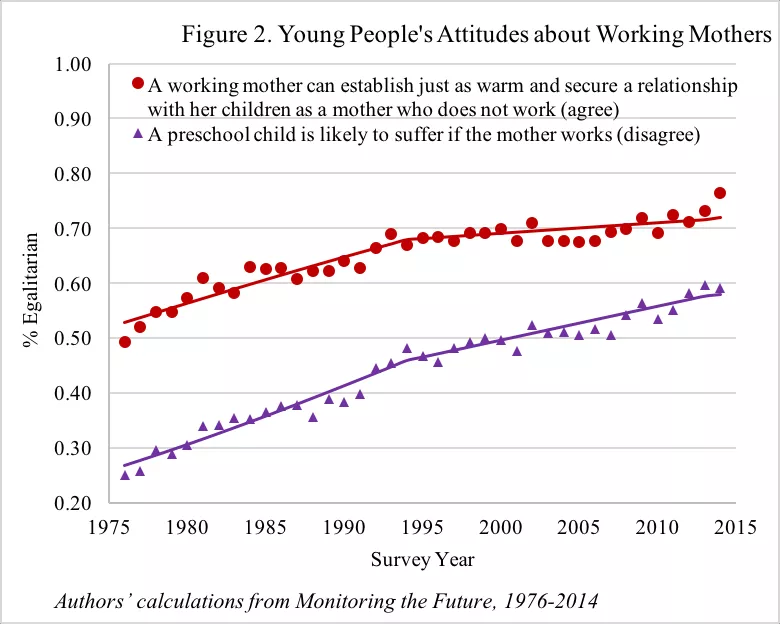 In fact, results show young men and women increasingly support women’s equality at work and are less likely to believe mothers’ employment harms children. We argue that these seemingly contradictory attitudes are evidence of beliefs in “egalitarian essentialism” – pairing beliefs that men and women are inherently different with commitment to equal opportunity. If you want to dig deeper into our findings, please check out our working paper, available on SocArxiv. Some post-election analysis has judged President-elect Trump’s pledge to revive hard-hit sectors of the economy as a superior strategy to so-called identity politics as a way to connect with voters. While we should pay attention to class inequality, we shouldn’t overlook the reality that centering economic issues is fundamentally about gender identity. The loss of manufacturing jobs is as much about changing gender norms as it is about class inequality, or blue-collar men would be filling the nursing shortage. Strategies to help hurting communities must focus on advancing women’s economic standing. New research shows that increasing educational attainment hasn’t translated into increased employment for single mothers. Women have a harder time repaying student loan debt, in part because of the gender wage gap. Domestic violence costs the economy $5.8 billion each year. Centering women is both imperative and possible. Despite the superficial interpretation that Trump’s election is a rebuke to feminist ideals, voters support specific policies that help women. In the November election, Washington and Arizona passed ballot measures that raise the minimum wage and require employers to offer workers paid sick and safe leave. Livable wages and paid leave strengthens women’s labor force participation and paid safe leave means women don’t have to choose between their safety and a paycheck for their families. It is hardly surprising that Trump’s rhetoric to double the rate the economy grows is improbable. Promising manufacturing jobs seductively trumpets narratives of masculinity, falsely promising a return to breadwinner wages. Trump’s proposed paid leave policy granting mothers six weeks of paid leave would be the least generous policy of any OECD country and efforts to reduce campus sexual assault are likely to end under the Trump administration. Concerns the administration will target funding for the Violence Against Women Act are becoming a reality. Dismantling State Department programs that promote gender equality will undermine both women and economic growth globally. Millennials now make up about an equal share of the electorate as the Boomer generation, which has generated much commentary on millennials' participation in the upcoming election. Based on data from American high school seniors, I find that 88% of millennials predicted they probably will vote in a public election. I used the yearly reports of high school seniors' attitudes collected in the Monitoring the Future Survey, an ongoing survey of American students' attitudes and behaviors conducted since 1976. The limitation of this data-set is that it doesn't include youth who dropped out of school before twelfth grade, which varies over time. About 90% of Boomer (seniors 1976 - 1982) and Generation X (seniors 1983 - 1999) members reported they will probably vote in a public election, when asked while they were high school seniors. Thus, the 88% of millennials (seniors 2000+) predicting they will someday vote is slightly down from previous generations of American youth. ​To put this into perspective, 83% of millennial high school seniors reported they think they will eventually choose to get married. By contrast, 78% of Boomers predicted they would eventually choose to get married, while 80% of Generation X reported they expected to marry. In context of actual marriage behavior, even as attitudes about expecting to marry are increasing, a small but increasing number of people will never get married. These disparities highlight a cautionary tale that expectations of future actions do not necessarily predict actual behaviors. 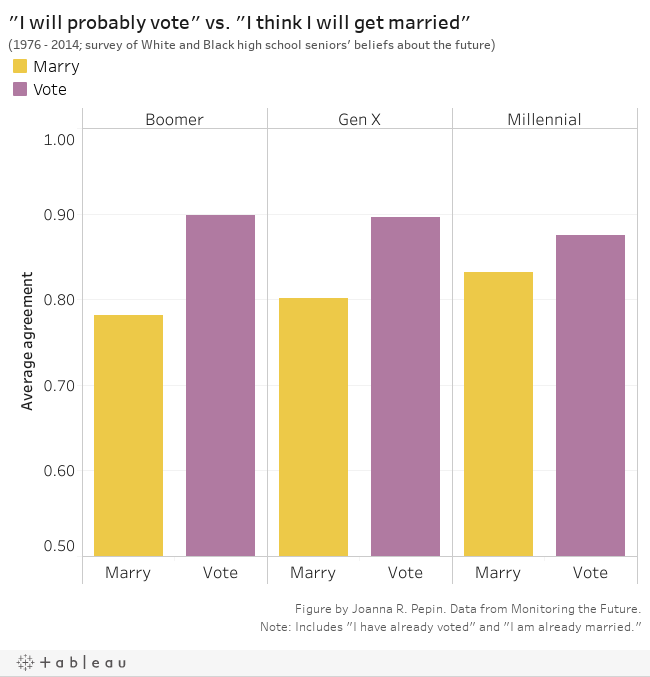 Notably, voting expectations remain higher than predictions of future marriage across the three generations. Past research shows Black men and women are less likely to vote or to marry compared with Whites. These differences in behavior reflect racial variation in predictions of future marriage and voting behavior. The Monitoring the Future data show young Black men and women are less likely to report they expect to marry or to vote in a public election compared to their White counterparts. The differences in attitudes between Black and White youth are narrowing. Young Black men and women are increasingly likely to predict they will get married in 2014 (71%) than they were in 1976 (57%). Black youth's expectations about voting in a public election remain largely unchanged. 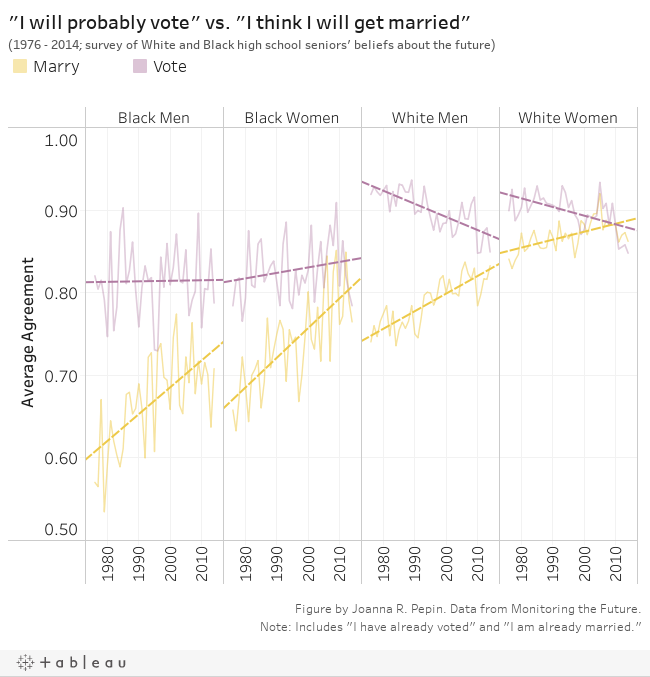 White youth are also increasingly likely to predict they will eventually marry but they are less likely to expect to vote in a public election in 2014 compared to 1976. By 2014, White youth were about as likely to think they will eventually marry as they were to expect themselves to vote in a public election. Note: Public data about other racial and ethnic minorities are not available in the Monitoring the Future data-set and thus this analysis is limited to White and Black youth.